Start the Traeger on Smoke with the lid open for 4 to 5 minutes or until the fire is established. If you don’t want to trim off the thinner ends of the tenderloin simply tuck the narrow “tail” ends under the tenderloin and secure them in place with butcher’s string to help it cook more evenly. Place the tenderloin on the grill and smoke for 1 hour. After you take the meat off the Traeger, turn the heat up to 400 degrees F and preheat, lid closed, for 10 to 15 minutes. Transfer the meat to a rimmed baking sheet. In a small bowl, combine the mustard, thyme, Worcestershire sauce, and the remaining tablespoon of olive oil and mix well. Brush or slather the mustard mixture over the outside of the filet. 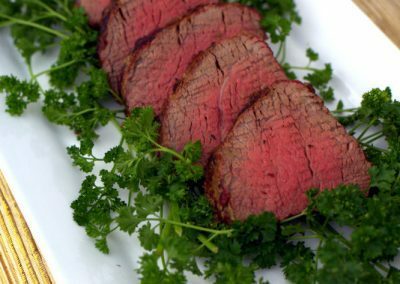 Put the filet directly on the grill grate and roast for 25 to 30 minutes, or until an instant-read meat thermometer registers an internal temperature of 135 degrees F (for medium rare). 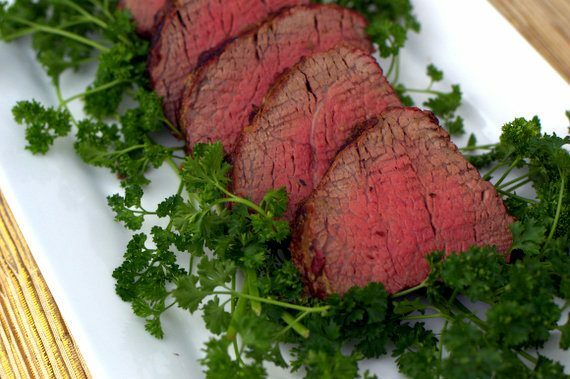 Cook less time if you prefer your meat rarer than that, or more time if you like it well-done. Transfer to a cutting board and let the meat rest, tented with aluminum foil, for 5 minutes before slicing and serving.